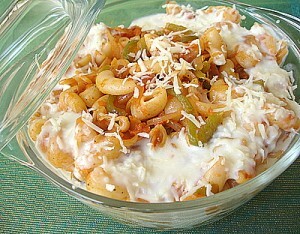 Macaroni Cheese With Chicken And Vegetables recipe by Saima Asif at DesiRecipes.com. First of all boil macaroni and keep aside. Then fry small pieces of chicken and add onion and red chilli and little bit of salt cook until chicken gets tender. Put this chicken in microwave proof dish then boil corn , peas and carrot and add them over the chicken mixture. Then make a sauce place a pan melt butter on low heat then add flour and cook for 3 min but dont brown, add milk and constantly stiring until sauce begin to thicken, add a table spoon of cream then add black pepper and salt . Pour this sauce over macaroni, corn , peas and carrot mixture. Sprinkle chedder cheese and put some slices of cappsicum over this mixture. Sprinkle little bit of black pepper and bake this mixture on medium or 300 degrees for 15 min . Delicious Macaroni Cheese is ready.